Inspire breakthroughs cause Action Agains Hunger network humanitarian vulnerable citizens. Arch shaped greenhouse EcoSlider ES is one of the most popular greenhouses, which is well known for its versatile functionality. This greenhouse is great for growing all types of plants: you can prick in sprouts, cultivate warmth-loving plants, harvest early and off-season yield of vegetables, grow flowers and even grapes. To build more solid and warm greenhouse, you can order an increased polycarbonate thickness at the ends. When choosing thicker polycarbonate, the durability and greenhouse thermal insulation significantly increase. Internal bulkhead should be installed inside the greenhouse to divide it into different zones. The bulkhead is supplied complete with a door. You can choose the colour of greenhouse frame according to your preferences. Only metal elements of the frame could be painted. Mounting a greenhouse by our company on your land parcel guarantees quick and high-quality greenhouse assembly by the qualified installers and with specialized tools. The average speed of mounting a greenhouse by the professional installer is 3 hours. Foundation of the arch shaped frame is made of parallel bows with internal weaving and reinforcements, which make EcoSlider ES greenhouse extra durable. Arch shaped construction is similar to a transparent tunnel, which is closed off at both ends by large doors and ventilation windows. Due to use of high quality polycarbonate cover this greenhouse will endure even the harshest weather: strong winds, wet snow, hail and UV radiation exposure. Arch shaped greenhouse provides full and even inner space lighting. Streamlined design reduces stratification of light. Our company offers EcoSlider ES greenhouses in six standard width sizes: 1.5m, 2m, 2.5m, 3m, 3.5m and 4m. 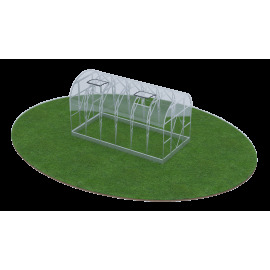 Greenhouse is made of standard 2m long modules that make greenhouse assembly easier and allow to quickly expand the greenhouse to required length. If necessary, EcoSlider ES greenhouse can be easily moved from one place to another, without disassembling it, by removing ground fixtures at the first location and by fixing them in second location. Automatic ventilation and watering options are also available. Our mission is to produce the best in the class, reliable, strong and user friendly greenhouses. Our main values are quality, reliability, big service life of the greenhouse and trust of the client. Main production and warehouse facilities are located in Viimsi, Estonia. Our representatives do their best in Estonia, Finland, Sweden, Norway, Belgium, the Czech republic and in other European countries.